If you love jalapeno poppers, everything bagels, and homemade pretzels, this recipe is for you! Popper filling stuffed inside soft baked pretzels covered in everything seasoning. To die for. For the pretzel dough, dissolve the yeast and sugar in the warm water in the bowl of a stand mixer. Let it sit about five minutes until frothy. Add in the flour, salt, and olive oil. Knead with a dough hook until it becomes a ball. Add the additional water if the dough is dry. Place in a large greased bowl and cover. Let it sit at least an hour or until it rises to double its original size. Meanwhile, blend the filling ingredients in a food processor and set aside. Mix the Everything Seasoning together in a small bowl and set aside. When the dough has risen, divide it into six sections. Roll each section into a "snake" or tube shape. Take a rolling pin and roll each snake to about 1 inch wide. Divide your filling into roughly six portions. Spread the filling down the center of the flattened snake, making sure to leave a little space on the sides to seal up the pretzel. Close the dough around the filling and roll again into a tube or snake. Twist the ends over themselves to look like a pretzel. Place them on a sheet pan sprinkled with cornmeal. Cover and let them rise again for about 20-30 minutes. Preheat the oven 450 degrees. Bring a large pot of water to boil. Add in the baking soda. Carefully drop a pretzel in and boil about 30 seconds, flipping it over halfway through. Place them back on the sheet pan and sprinkle the everything seasoning on top. Repeat with the remaining pretzels. 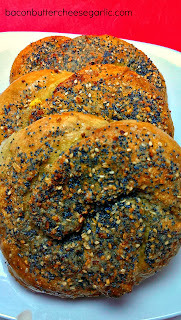 Bake each pretzel 20-30 minutes or until well browned on top. When you were a kid, did you hate Tuna Noodle Casserole? I actually only hated it when I was really young, like at age 5. But, as I got a little older, I really started liking it. Egg noodles, creamy sauce, tuna, peas, and mushrooms. Yum. Back then (I won't tell you what decade that was) it was usually made with cream of chicken soup or cream of mushroom soup or some "cream of" soup. As a young adult, I used to cook with those things all the time. I even used to cook Hamburger or Tuna Helper. Shocking, I know. Don't get me wrong. Those are good products for busy people or those that don't want to spend a lot of time in the kitchen. I have just come to love making almost everything from scratch. Now that we have teenagers, it's interesting to see what they like and don't like. Our daughter is extremely not picky. In fact, she will try anything and eat most things. She even likes sushi. Our son, on the other hand, is a lot closer to the picky side. At age 12, he still won't drink sodas, which is a good thing. He picks things out of food that I cook. And we learned just the other day that he doesn't like Tuna Noodle Casserole. My husband, daughter, and I loved this casserole, but the boy didn't. Picky. He's one of those kids that will gag when forced to eat something he doesn't like. Guess you can't win them all. So let me tell you about this Tuna Noodle Casserole. It has a sauce made from heavy cream. It has two kinds of cheese. It has crushed Butter Garlic Ritz crackers on top. I even used Cavatappi pasta instead of the egg noodles. Cavatappi is a hollow tube pasta that's twisted. (See? Twisted Tuna. I"m so clever.) So it's kind of an updated better version of an old comfort food favorite. Melt the butter into a large skillet over medium high heat. Drizzle in some olive oil and cook the onion and celery until tender. Add in the mushrooms and cook until they are browned and tender. Remove the veggies from the skillet. Whisk in the flour. Add in the cream, lemon juice and garlic. Whisk and cook until thickened and bubbly. Remove from heat and stir in the veggies, tuna, frozen peas, and parsley. Combine this with the drained pasta. Preheat the oven to 350 degrees. Spread the tuna noodle mixture into a 9 x 13 pan. Sprinkle the shredded cheeses over the top. Sprinkle the crushed Ritz crackers over the cheese. Bake about 15 to 20 minutes or until heated through and the cheese is melted and the Ritz crackers are slightly browned. Ever watch the Food Wars shows? I don't know if they're still airing or not, but we watched a few of them. There was one episode in particular that featured two restaurants that claimed to have the best Italian beef sandwiches. 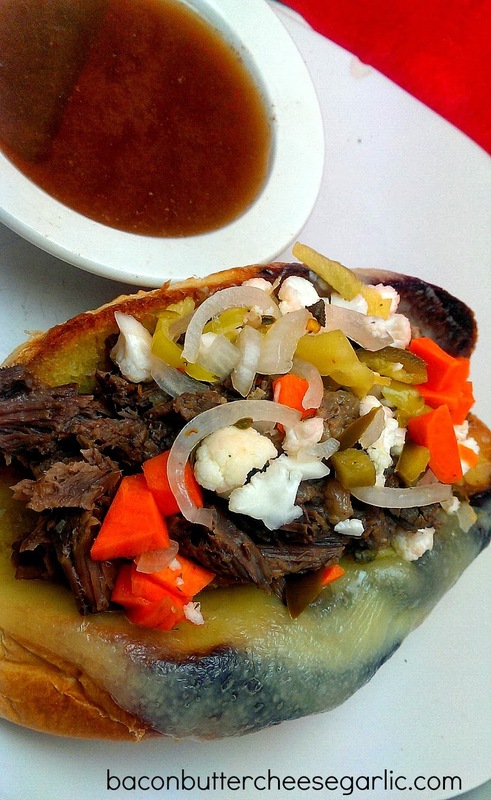 The Chicago Italian Beef Sandwich features thinly sliced beef and spicy Giardiniera, which is pickled vegetables. The meat is stuffed into a sandwich roll, topped with the Giardiniera, and then the au jus that the meat was cooked in is spooned over the whole thing or sometimes the whole sandwich gets dipped in the au jus. Now, I've never been to Chicago and I don't have a trip planned anytime soon. While my sandwich may not be an exact replica and wasn't cooked in the traditional way, it is a pretty good sandwich. And I cooked it in the crockpot which made it a really easy meal. I did make the Giardiniera homemade, but you can buy it in the jar. Also, whenever I need beef stock for a recipe, I use the beef bouillon paste in a jar. It has a much richer, beefier flavor than the broth or stock in a box. And, of course, you know me. I just had to put cheese on my sandwich. Put the roast, Italian dressing mix, chopped Giardiniera, beef stock, garlic cloves, and salt and pepper into a crockpot. Cook on low for about 6-8 hours or until tender. When the beef is ready, remove it from the crockpot and shred it when cool enough to handle. Strain the juice (au jus) and reserve it for dipping the sandwiches in it. To assemble the sandwiches, split the rolls open and place a slice of the Swiss cheese in each (if desired). Melt the cheese under the broiler. Put some of the roast into the roll and top with additional Giardiniera. You can either spoon the au jus over the sandwiches or dip the sandwiches in the au jus. I love being married, and I dearly love my husband, John. He is the kindest, sweetest man and I am so blessed to have found him. He makes me laugh. We have great conversations. He is truly great, and we are perfect for each other. Sappy, I know. I apologize. I have to apologize again for this post. I am really really really bad for your diet. I can't help myself. I just have to do things like this. It must be in my DNA. Don't get me wrong, I love salads and veggies too. But I have a weakness (besides bacon, butter, cheese and garlic). I love party food. I will spend an entire day in the kitchen making 10 different appetizer dishes for a football game. It's just that dipable, hand-held, bite-size morsels really bring joy to my heart. And bacon. Bacon does that too. So what does all that have to do with marriage? Well, I'll tell you right now. My Bacon-Wrapped Jalapeno Popper Stuffed Chicken got married to my Cadillac Queso, and they had babies, quadruplets! And they were all so darn tasty that we ate them all. If you're a party food fan, this dish is for you. The end. Preheat the oven to 350 degrees. 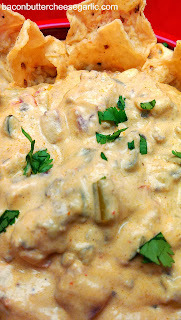 For the filling, mix cream cheese, Parmesan cheese, garlic, jalapenos and shredded cheese in a food processor. Next, carefully butterfly the chicken by slicing through the thickest part of the chicken lengthwise. Continue pulling the top back until you've opened it kind of like a book, being careful not to go all the way through to the bottom. If you need a video tuturial, watch this video on how to butterfly chicken. Divide your filling into four. With your hands, mash the filling into an oval ball shape. Place the filling in the chicken. Fold the other side of the chicken down over the filling. Secure with toothpicks, making sure no filling is showing through. **Tip...use three toothpicks per chicken breast. That way you'll know how many to look for and pull out. Wrap two slices of bacon around each chicken breast. Put them in a glass casserole dish and cook about 20-25 minutes or until the chicken is done and bacon is crisp. Don't worry if some of the filling cooks out. Just spoon that over your chicken after it's done. 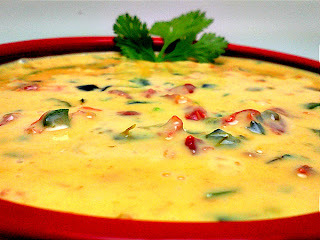 While the chicken is cooking, make the Cadillac Queso (recipe to follow). When the chicken is done, remove the toothpicks and spoon the queso over the chicken. You will have extra queso, so make sure you buy some tortilla chips for the leftovers! Put all of the ingredients in a large microwave-safe bowl. Cook in three-minute increments, stirring in between, until the Velveeta and cheese are all melted. 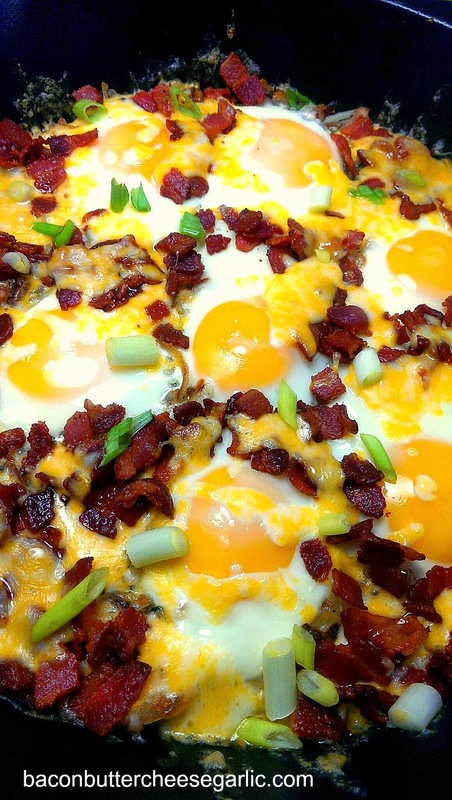 This is a one-skillet dish, all in one breakfast! You will need an ovenproof skillet, preferably cast iron. I used frozen shredded hashbrowns because I haven't mastered the art of making homemade hashbrowns...yet. Enjoy! Drizzle some olive oil into a large skillet and preheat to medium high heat. Spread the hashbrowns around in an even layer. Spread the onions, serrano pepper, and cilantro on top of the potatoes. Cook, without disturbing, about 4-6 minutes until browned. Season that side with salt and pepper. Flip the hashbrowns over and continue to cook another 4-6 minutes or until browned. Season with salt and pepper, as desired. Remove from the heat. Preheat the oven to 375 degrees. Using a spoon, make little holes in the hashbrowns and crack the eggs into the holes. Cook about 10 minutes or until the whites are set and the yolks are the desired consistency. Turn the broiler on. Spread the bacon and cheese around on top of the eggs and hashbrowns and broil a couple of minutes to melt the cheese. I've said it many times before how much my husband loves pasta. He even gets me to try to make homemade pasta from time to time. I've only been successful a couple of times, but I'm going to keep trying. You should see us in the kitchen, though, when we've tried. We have such great teamwork together, although he tends to be a little bit messy. The last time we tried to make ravioli, he was covered in flour. It was in his hair, on his clothes, even in his flip-flops. But it was still fun, and we have some great laughs in the kitchen. When I come across something that combines spicy and pasta, it's a must that I try it. This is a super easy and flavorful dish and it's made in one skillet! Pasta and all! It has chicken, smoked sausage, jalapenos, serrano pepper, Rotel and Pepper Jack cheese. And it was right on the money! My husband and our kids loved it, although our son had to drink a lot of water while eating it. It will surely be repeated a lot at this house. Afraid of all the spicy? That's okay. Use Monterey Jack cheese instead of Pepper Jack. Skip the jalapeno slices and serrano pepper if you want. Make it yours. Just make it soon. Drizzle some olive oil into a large skillet. Cook the onion and serrano on medium high heat until tender. Add in the sausage and cook for a couple of minutes to brown. Add in the chicken, garlic, cumin, chili powder, garlic powder, jalapeno slices, and the Rotel. Season with salt and pepper, to taste. Add in the chicken stock and cream. Bring to a mild boil. Add in the pasta and stir. Cover the skillet and cook until the pasta is tender, about 10 to 15 minutes. Remove from heat and stir in the cheese and the cilantro. We are a wings family. Now that football season is upon us, it's the perfect time to get out the Fry Daddy and fry up some wings! They are the perfect football food. Pair them with some cool Ranch dressing and a cold beer, and the party is in full swing! My husband is a HUGE Cowboys fan. Yep. He's the guy who wears the jersey and has a Cowboys beer koozie and cheers really loudly during the game. I really enjoy watching that man during a game. We actually got to go to the Superbowl in 2011 in Dallas between the Packers and the Steelers. This is actually kind of a funny story. We decided to root for the Packers (don't hate). We got shirts and bundled up and headed there. Our friend dropped us off since the traffic is a nightmare. We started about five or six blocks north of the stadium and worked our way down. There was such a huge party going on all around. There were bars packed full of people. The parking lots all the way down the road had tailgaiters in them. We started at a bar called Louie Louie's which is a dueling piano bar. Have you ever been to one of those? It was super fun. The place was empty since they didn't have a big screen TV, so we had the duelers to ourselves. You walk up and hand the piano player some money and tell them what song you want and they play it, often changing the words. So we meandered down the streets checking out the bars and the parties, and then we headed to the stadium. We actually only had party pass tickets, which meant we got to watch on a big screen outside. So we headed to our checkpoint with our backpack complete with an umbrella and other necessities. That's when things started going awry. You aren't aloud to carry any bags into the stadium or even to the party pass area. So we stuffed our coat pockets with as much as we could and ditched the bag and the umbrella. No big deal. We got to our area a little late, and all of the outside tables were full. All of the gas heater lamps had people crowded around them. It had turned colder, but we dressed appropriately so we'd be okay, right? Then we headed to the beer lines. Long lines. Very long lines. They had run out of beer (already? ), so we had to wait for someone to bring more. And what did they have to drink? Only Miller Lite. $9 cans of Miller Lite. Now, you could buy two at a time, but only Miller Lite. I don't even really like beer, and my husband likes Mexican imported beer. But we were going to make the best of the situation and drink those beers. So we finally got back to our area with our two beers in hand after missing the start of the game. I couldn't really see over the tall people around me, but I could hear the game. Then it started raining. Not a downpour, but enough to chill us even more. After sticking it out in the rain, with the crowd, no visibility of the game, and bad beer (don't hate), we decided to leave. We walked the several blocks back up to where we were dropped off and went to our friends' house. It was warm there. They had a big screen TV. They had snacks. And they had good beer. Now, don't get me wrong. I'm glad to say that I got to go. It's a once in a lifetime kind of thing. But, if we decide to go again, I think we'll get seats inside the stadium where there's good beer and snacks and warmth. So back to the wings. 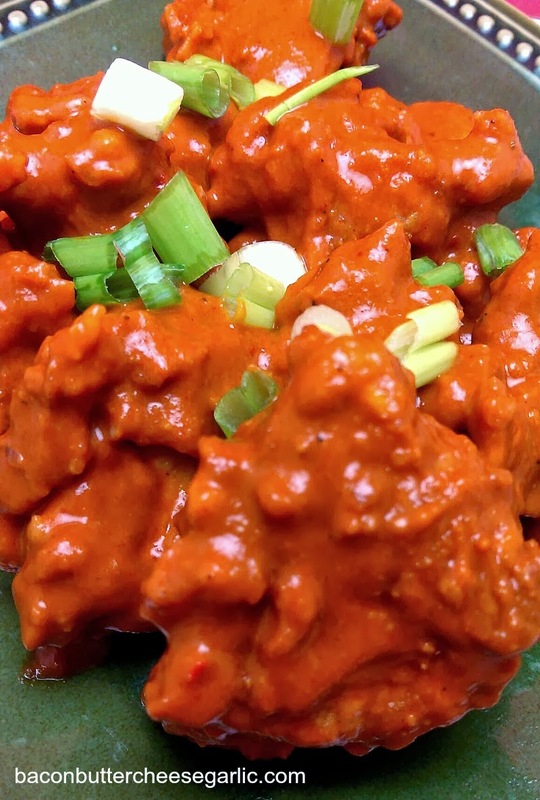 These are bone-out wings complete with a homemade Buffalo sauce. A little effort, but so worth it! Put the chicken in a casserole pan and cover with buttermilk. Add in the Cajun seasoning and stir. Cover and refrigerate for at least an hour. Remove the stems from all of the chiles. Because there are so many chiles, you will want to wear gloves, especially with the Habanero. Throw all of the chiles, seeds and all, into a blender. Add in the peeled garlic cloves. Pour enough vinegar in the blender to cover the peppers. Blend until mostly smooth. Pour this mixture into a large pot. Add in the cayenne, chili powder, salt and pepper. Bring to a boil, then reduce to simmer. Continue simmering for about 20 to 30 minutes or until reduced and thickened. You may want to keep the exhaust fan on because vinegar cooking can be unpleasant to smell. When the sauce is thickened, remove from heat and strain the sauce, discarding the seeds and skins that are left behind. If the sauce is too thick, you can add in a little more vinegar at this point. Melt the butter in the same pot and cook the onion until tender. Add in the strained sauce, the tomato sauce, brown sugar and lemon. Whisk and stir and cook until the desired consistency. You can blend it again at this point if you don't want the chunks of onion in the sauce. I used an immersion blender to do this. Remove from heat. Preheat your oil in a deep fryer or tall pot to 350 degrees. Preheat the oven to 200 as a holding station for the chicken. To set up a dredging station, put about 3 C flour in a large bowl and sprinkle in more Cajun seasoning and mix. Dredge the chicken into the flour, back into the buttermilk, and back into the flour. Fry in batches until golden brown. Keep the fried pieces warm in the oven on a sheet pan until they are all fried. Put the sauce into a large bowl and then add the chicken. Shake to coat. Serve with Ranch dressing. 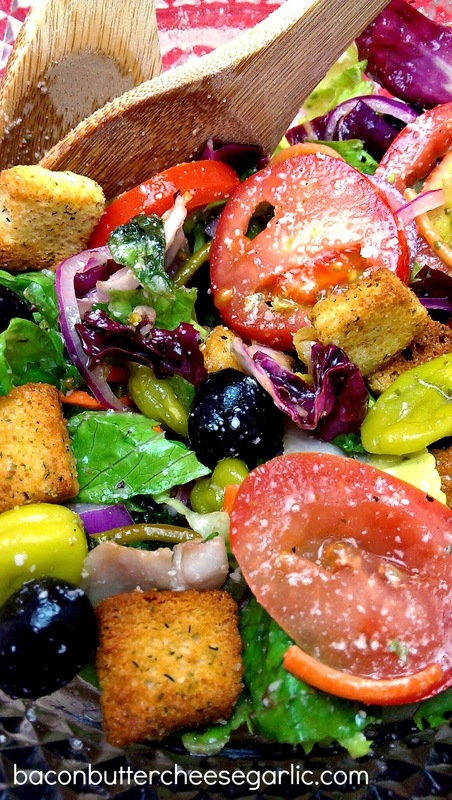 I know there are a multitude of copycat Olive Garden's salad dressing recipes out there. Trust me, I've tried a lot. The majority of them include mayonnaise in their recipe, but it just wasn't right to me. A lot of the recipes also use some type of sweetener, like corn syrup. But, when I've eaten salad at Olive Garden, I don't taste sweet at all. I've tried with straight olive oil to no olive oil. I tried with the mayo and without. I tried with shredded Parmesan and grated Parmesan. After tweaking and trying many times, I think this is about as close as you can get. The flavor to me was spot on! Give it a try and see for yourself. Whisk all of the dressing ingredients together well to combine. Chill for at least an hour. Assemble your salad with as much or as little of the salad ingredients as you like and dress with the chilled dressing. It's no secret that I love cheese. It's one of the New Four Food Groups, so it's necessary for me to live. I'm that person that people say to me, "would you like some soup with that cheese." I hear that a lot at work. I just can't help it. Melty, gooey, cheesy goodness is something I crave. And I'm not stingy with it either. Our dogs love cheese too. In fact, that's the only way we can get our 1-year-old Boxer, Cooper, to come in the house. He loves to be outside and doesn't want to come in. "Who wants cheese" is the only way to get him in. Our other dog, Bentley, does come in when asked, but he gets the cheese too right alongside Cooper. And have you ever been around a Boxer puppy? Although he weighs probably 70 pounds, he thinks he's a lap dog. He is a very entertaining dog and he loves to put on a show. He prances and hops around in the back yard like a kangaroo. He also watches TV and frequently jumps up on the armoire the TV is in and tries to bite the TV screen. So enough about dogs. This is about pasta. Stuffed shells, to be exact. And four different kinds of cheese. I know, that's a lot. But I just can't help myself. 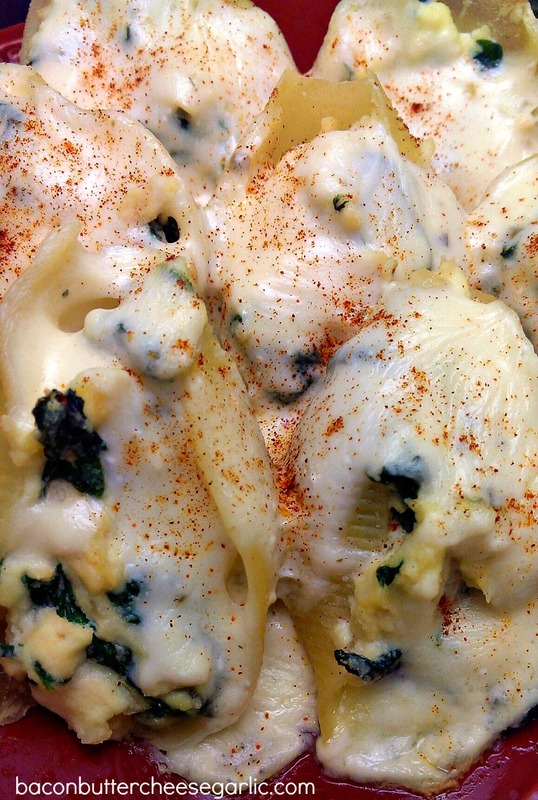 The filling is chicken, spinach, and ricotta cheese. And the sauce, my oh my, the sauce. Pepper Jack and Monterrey Jack and cream cheese make a delicious, creamy sauce to pour over these tasty little shells. I think you're going to love these. To make the sauce, melt the 2 T butter in a pot on medium heat. Whisk in the flour to combine. Add in the chicken stock. Cook and whisk until thickened and bubbly. Whisk in the cream cheese and keep whisking until it's melted and smooth. Add in the shredded cheese, a handful at a time, and continue whisking. Keep adding the cheese and whisking until it's all incorporated and smooth. Set aside. Melt the 2 T butter in a skillet and drizzle in some olive oil. Cook the onion at medium high heat until tender. Add in the spinach and garlic and season with salt and pepper. Cook and stir until the spinach is completely wilted. Remove from heat. Preheat the oven to 350 degrees. In a bowl, combine the chicken, ricotta, spinach mixture, and the egg and season with salt and pepper, to taste. It's easiest to do by hand. Put some of the filling into each shell (I had a few shells left over). Place the shells in a casserole pan. 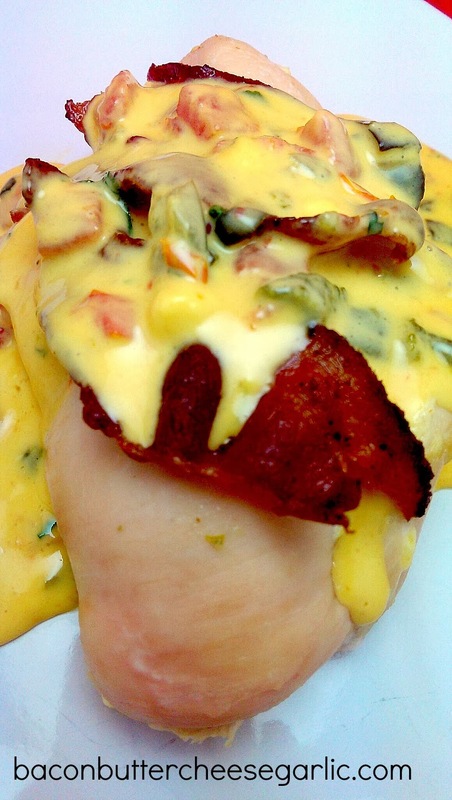 Pour the cheese sauce over the top. Bake for about 20 minutes or until the filling is cooked through. Garnish with a sprinkling of paprika, if desired. It's getting to be that time of year again. Fall. I am always reluctant for Fall to come. I am completely a summer girl. While I may not embrace cooler weather, there are some things I will embrace about Fall...football, watching movies since we can't swim, snuggling under blankets, and the food. Ahh, the food that comes with cooler weather. Soups, stews, roasted meats, hearty comfort food. I'm kind of glad for the change for the reason that I can cook a whole different set of recipes. So, as the beginning of Fall approaches, I decided to make a different kind of taco than you are probably used to. This one is called Carne Guisada, which loosely means meat cooked long and slow like a stew. It is essentially TexMex beef tips in gravy. It is eaten in tortillas for breakfast, lunch, and dinner. There are probably as many versions of this dish as there are Hispanic households. Mine has beef tips, serrano peppers, and spices in a tomato and beef stock. A Hispanic lady that I work with puts green beans in hers which sounds fabulous to me. But I wanted to try it the traditional way (sort of) before I got crazy with it. I also threw in a small can of El Pato Mexican style hot sauce. But you can use a can of tomato sauce if you don't want the heat. It's optional. If you can't find it and want the heat, add in some cayenne pepper. 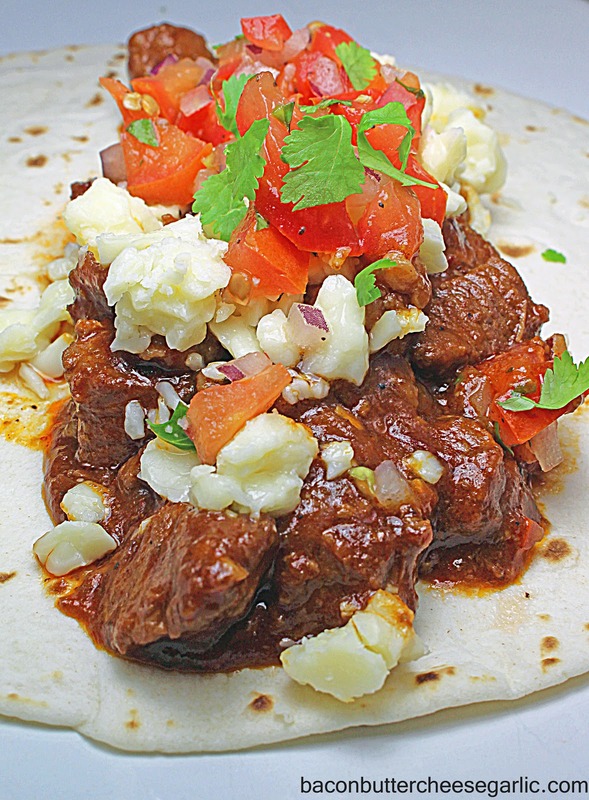 I think you are going to fall in love with Carne Guisada. Heat the peanut oil to high heat in a dutch oven or large pot. Sear the meat on all sides in two batches. You are just getting color, not cooking it. Remove it from the pan and set aside. Add the onions and the serranos to the pot and reduce the heat to medium high. Cook until the onions and serranos are tender. Pour in the beer. Scrape up any browned bits in the pot. Bring the liquid to a boil and cook until most of the liquid has cooked out. Add in the remaining ingredients except the flour and return the beef back to the pot. Bring to a boil and then reduce the heat to medium. Cover and cook 1 to 1 1/2 hours or until the beef is very tender. Put the flour in a bowl and add in a ladle of the beef liquid. Whisk until smooth. Pour this mixture back into the pot and stir. Cook an additional 5 or so minutes to thicken the sauce to a gravy consistency. Serve on flour tortillas with crumbled Cotija cheese and Pico de Gallo. So I wanted to make a dish that contains all of the "New Four Food Groups." 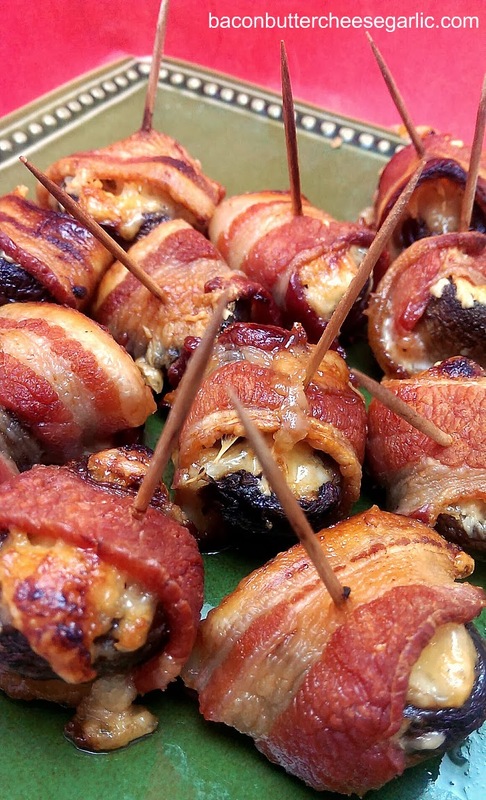 I came up with this: Mushrooms stuffed with shredded butter (yep, that's what I said), roasted garlic, and Monterrey Jack cheese and wrapped up with bacon. They are so good, they bring a tear to my eye. Cut the tops of the garlic off to expose the cloves. Place the cloves in a piece of foil. Drizzle olive oil over the tops and season with salt and pepper. Wrap them up and bake at 400 degrees for 20 to 25 minutes or until the cloves are very soft and buttery. When they have cooled, squeeze the cloves out of the skins (a little messy). Chop the garlic. Lay the mushrooms in a single layer in a large casserole pan. Using a box grater, shred the butter. Place little shreds of butter into each mushroom cap. Add little bits of the garlic into each mushroom. Press the cheese into each cap. Wrap each mushroom with a piece of bacon and secure with a toothpick. Bake at 350 degrees for about 20-25 minutes or until the bacon is done. This dip has a lot of ingredients, but it's cooked in the crockpot. You just throw everything in there and wait! So good, it's like you just made a touchdown! Roast the poblanos in a 400 degree oven, rotating occasionally, until the skin is black and charred. When they are cool enough to handle, peel as much of the skin off as you can. Remove the stem and seeds and chop. Put all of the ingredients into a crockpot. Cook on low, whisking occasionally, for about 2 1/2 hours or until the shredded cheeses have melted. Serve with tortilla chips. These are crazy good! Buttery shrimp, roasted poblanos, an amazing white nacho cheese sauce, and Pepper Jack cheese! Roast the poblanos in a 400 degree oven, rotating occasionally, until the skin is black and charred all over. Remove from the oven. When they are cool enough to handle, peel as much of the skin off as you can. Remove the stem and seeds and chop. To make the white nacho cheese sauce, cook the veggies in the 3 T of butter until tender. Whisk in the flour and cook about a minute. Add in 1/2 C chicken stock and whisk. Stir in the Velveeta and garlic powder. Cook and stir until the cheese is melted. If the sauce is too thick, stir in the other 1/2 C chicken stock. Remove from heat. Cook the shrimp in the 2 T butter in a skillet until they are done, about 3-4 minutes. You can season this with a little garlic powder and salt and pepper if desired. Preheat the broiler. Lay the chips (about 35) in a single layer on a sheet pan. Place a little of the chopped poblanos in each chip. Spoon some of the nacho cheese sauce into each chip (you will have some left over). Place a shrimp on top of each chip. 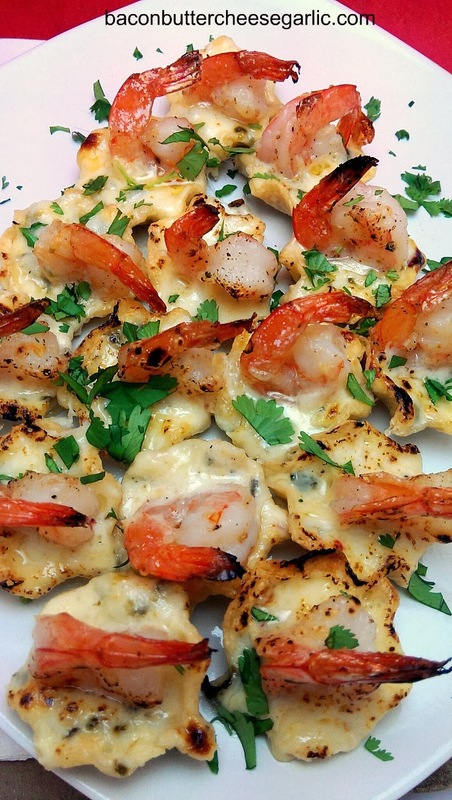 Sprinkle the Pepper Jack cheese over the shrimp. Broil for a couple of minutes until the cheese is melted and browned. Having a football party? Here's some bangin' recipes for your friends and family to snack on! This dip has a lot of ingredients, but it's cooked in the crockpot. You just throw everything in there and wait! Let's go back in time, shall we? We are traveling back to 1981. Reagan was President. Princess Diana and Charles got married. And Toni Basil gave us "Mickey." Remember that? "Oh, Mickey you're so fine, you're so fine you blow my mind." I remember standing in the living room with my legwarmers on and 15 bracelets watching her video on MTV. Yes, they really used to show music videos on MTV. I would watch videos all day long. I am a huge fan of '80s music, and I think some of the best videos came from the '80s. You may disagree, and that's okay. But just Google Tom Petty's "Don't Come Around Here No More" video. Or "Take on Me" by Aha. Or "Thriller" by Michael Jackson. One more...Peter Gabriel's "Sledgehammer." Good times. So what does any of that have to do with cooking? Nothing, except that, when I was thinking about this post for Chicken Pesto Pasta, the word "basil" reminded me of Toni Basil. You know how you sometimes wonder what led your thoughts to something and then you have to backtrack to think of what the heck it was that got you to that thought? That's what just happened to me. Now back to business. This pasta turned out amazing. There are a lot of ingredients in it, but I made it easy by roasting all of the veggies and the sausage in the oven. Roasted veggies take on so much flavor. Then I just had to boil pasta and make pesto in the food processor. 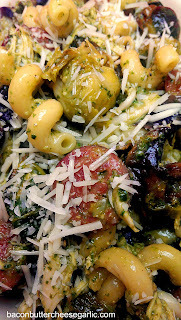 There is chicken, sausage, brussels sprouts, mushrooms, tomatoes, pasta and pesto in this dish. It was so full of flavor. You can use whatever sausage links you like here, even chicken sausage. My husband, who doesn't like the smell of fresh basil, actually really liked this pasta. I think you will too. Preheat the oven to 400 degrees. Remove the outer leaves of the brussels sprouts. Cut off the root end and cut them in half. Drizzle some olive oil around on a large sheet pan. Lay the brussels sprouts cut side down on the sheet pan. Place the onions, peeled garlic, tomatoes, mushrooms and sausage slices in a single layer on the sheet pan (you may need two sheet pans). Drizzle the top of all of this with more olive oil and season with salt and pepper. Put the pan(s) in the oven and cook until the veggies are all tender, about 20 minutes. Remove from the oven and chop the garlic. Cook the pasta according to package directions and reserve 2 C of the water before draining. Put all of the pesto ingredients except the olive oil into a food processor or blender. Blend well. Turn on the food processor or blender and stream in the olive oil and process until well combined. Taste for salt and pepper and adjust accordingly. Toss the roasted veggies, garlic, sausage and chicken with the pasta. Stir in the pesto. Add in 1 C of the reserved pasta water and mix. If the sauce is too dry, add in the other cup. Garnish with additional shredded Parmesan cheese, if desired. I don't usually eat fast food. It's not that I don't like it. It's just that I think food cooked at home is a lot better tasting and a lot better for you. When I was younger, I really loved fast food and ate it regularly. But, now that I'm an experienced cook, I like knowing what goes into our food. I do, however, like the concept of some fast food items. 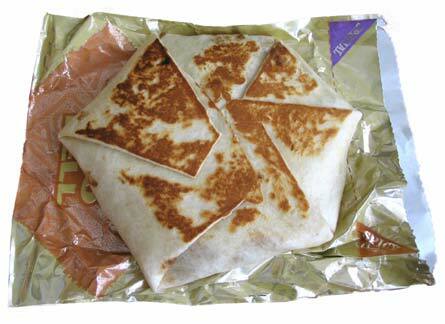 For instance, the Crunchwrap Supreme from Taco Bell. Now, I've never eaten one, but I've seen a lot of people recreate it on Pinterest. So I decided to create my own. So I'm calling this a Double Decker Taco Wrap just because I can call it whatever I want. It's a flour tortilla with layers of refried beans, a tostada shell, taco meat, nacho cheese sauce, lettuce, and shredded cheese. Then it's folded up kind of in a hexagon shape and grilled. Let me tell you, these turned out great. And the star of the show? The Garlic & Jalapeno Nacho Cheese Sauce I made. It turned out so good that I'm going to use that same sauce in many more dishes. So, if you're like me and prefer home-cooked meals, give this one a try. They are super delicious! For the taco meat, cook the onion in a large skillet in olive oil until tender. Add in the ground beef, garlic, and tomato. Cook until the meat is done. Drain if necessary. Add in the taco seasoning and the water called for on the taco seasoning packet. Cook until most of the liquid is gone. For the nacho cheese sauce, cook the onion and jalapenos in the butter until tender. Whisk in the flour. Add in the Velveeta, garlic, garlic powder, and cilantro. Cook and stir to start melting the Velveeta. Add in 1/2 C chicken stock and stir until the Velveeta is melted. Add in the remaining chicken stock if the sauce is too thick. Remove from heat. To assemble the wraps, spread some beans (about the size of the tostadas) in the center of a flour tortilla. Lay a tostada on top. Spread some taco meat on top of the tostada. Top with cheese sauce, salsa, shredded lettuce, sour cream and cheese. Don't overfill them so that they will close. Fold the edges of the flour tortilla over the filling and try to make sure none shows through. You'll have a five-sided wrap. When they are all stuffed and folded up, melt a small amount of butter onto a flat skillet or grill pan. Grill them on both sides until browned. 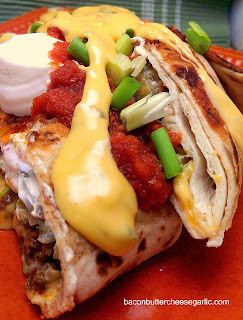 Garnish with more cheese sauce, sour cream, salsa, and green onions, if desired. So our 12-year-old son is playing football at school. He is really enjoying it, but it's a little scary for me. He is 5'6" tall and wears a size 11 shoe, but he's skinny. He already got tackled and had a bump pop out of his wrist. He is excited about the prospect of tackling people, and I suffer extreme anxiety at the prospect of him getting tackled. What if they break him? Yes, I know I live in Texas and, yes, I know I live in a college town where football is very important. But he's my son. I imagine myself running out on the field, grabbing another kid by his face mask, and scaring the Skittles out of him. Then some other mom would run out on the field and it would BE ON! I would be banned from junior high football forever. Okay. On to the real reason we're here. 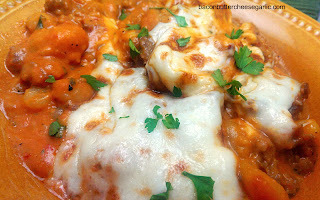 Have you ever had gnocchi? If not, they are little potato dumplings used in place of pasta. They look like little footballs. (Nice tie in to my story, huh.) My husband loves gnocchi. (I say he loves something a lot, don't I.) So I made Gnocchi al Forno, which means gnocchi from the oven. This is so tasty with marinara, cream, pancetta, Italian sausage and, of course, topped with a lot of cheese. So darn tasty! If you haven't had gnocchi, you need to try it. They are so good. By the way, the first Cowboys game of the season is in TWO DAYS!!! Cook the pancetta in a large skillet until crisp. Drain on a paper towel lined plate. Drizzle some olive oil into the same skillet. Cook the onion over medium high heat until tender. Add in the sausage and the garlic. Cook, breaking the sausage up as you go, until the sausage is done. Drain the grease, if necessary. Add in the marinara and heavy cream and season with salt, pepper, and chili flakes to taste. Stir to incorporate. When the sauce is heated through, remove from heat and stir in the parsley and reserved pancetta. Preheat the oven to 350 degrees. Mix the gnocchi together with the sauce. Pour this into a 9 x 13 casserole pan. Sprinkle the Mozzarella and Parmesan all over the top. Bake about 15-20 minutes or until heated through and cheese is melted and browned on top. I've made it no secret that I love enchiladas. So much so that maybe I should have a separate index tab just for enchiladas. I've tried too many versions to count. But this one, my friends, is something truly special. We are huge fans of Buffalo wings, so what better thing to do than make Buffalo Chicken Enchiladas. 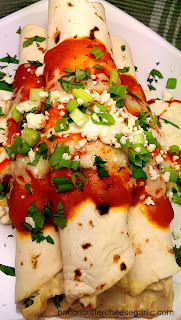 Creamy chicken filling with Ranch, spicy Buffalo enchilada sauce, blue cheese and green onions are a fabulous combination. If you are a wings fan or an enchilada fan or both, you will love these. Trust me. The leftovers are just impressive as the firstovers. Or however you should say that. Pop out that bottle of Frank's. You're gonna want to make these now. To make the chicken filling, drizzle some olive oil into a large skillet. Cook the celery, onion, and carrot until tender. Add in the butter and flour and mix to coat. Add in the chicken stock and garlic and whisk. Cook and whisk until bubbly and thickened. Stir in the sour cream and Ranch to taste. Remove from heat and stir in the chicken. For the sauce, melt the lard in a skillet and whisk in the flour. Whisk in the chicken stock and remaining ingredients, using as much or as little Buffalo sauce as desired. Cook and whisk until thickened and bubbly. Remove from heat. Preheat the oven to 350 degrees. Heat the tortillas in a damp towel in the microwave for a minute or two until pliable. Ladle half of the enchilada sauce into a 9 x 13 pan. Spoon some of the chicken mixture into each tortilla and roll them up. Lay them in the sauce. Top the enchiladas with the remaining sauce. Sprinkle the shredded Pepper Jack cheese over the top. Bake for about 15 to 20 minutes or until they are hot all the way through and the cheese is melted and browned. Garnish with the blue cheese, green onions, and additional Buffalo sauce and Ranch dressing if desired. Sometimes I like to take a recipe and see if I can make it taste the same but assembled differently. Chile Rellenos are a Tex-Mex favorite, and they are a favorite in this household too. So why not make it a casserole! 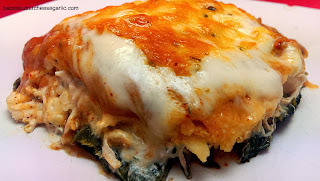 I cook meals for another family, and the dad in the family loves Chile Rellenos. Imagine his excitement when I delivered this meal to him. Although it's probably not any healthier than fried Chile Rellenos, it is a little easier than the stuffed version. Our picky 12-year-old son even loved this, which is surprising because he won't go near peppers. Maybe if I told him peppers would save his life then he would eat peppers. But he did eat these. Poblanos are mild and very delicious. They are great in many Tex-Mex dishes. So, with layers of roasted poblanos, chicken filling, corn tortillas, Chili Gravy (another Tex-Mex favorite), and, of course, lots of cheese, this Chile Rellenos Casserole was a big hit around here. And we didn't have to get out the deep fryer, which is a great day in my book. And no delicate stuffing of a pepper made for an easy meal. Do your kids eat peppers? To roast the poblanos, put them on a sheet pan and cook them at 400 degrees, turning occasionally, until the skin is charred all over. Remove from the oven. When they are cool enough to handle, peel as much of the skin off as you can. Cut off the stem end. Make a slice down one side of the pepper, not all the way through, so that you can open the pepper up and lay it out flat. Scrape out the seeds. Reduce the oven temperature to 350 degrees. To make the chili gravy, melt the lard in a skillet over medium high heat. Whisk in the flour. Whisk in the chicken stock and the remaining ingredients. Cook and whisk until thickened and bubbly. Remove from heat. To make the chicken filling, cook the onion and jalapenos in some olive oil over medium high heat until tender. Add in the chicken, garlic, cream cheese, Ranch Dip mix, and chicken stock. Cook and stir until the cream cheese is melted. Remove from heat. To assemble the casserole, first soften the corn tortillas in the microwave in a damp towel. Ladle half of the chili gravy into an 8 x 8 casserole pan. Lay the poblanos flat in the bottom of the pan, overlapping if necessary. Spread the chicken filling over the poblanos. Lay the tortillas over the chicken filling, overlapping if necessary. Ladle the remaining chili gravy over the tortillas. Sprinkle the cheese all over the top. Bake for about 20 minutes or until heated through and the cheese is melted and browned.